We would like to extend a warm welcome to TCI's new Marketing Administrator, Amelia Cornell. She is currently in charge of Fabtech preparation, maintaining and administering the company CRM system, and managing content for marketing campaigns and more. Amelia hopes to expand her marketing knowledge as much as possible and to become a helpful asset to TCI to assist in our growth and success. "I can already tell this position is going to offer me plenty of chances to learn, both about the industry and how to improve on my marketing skills," Amelia says. 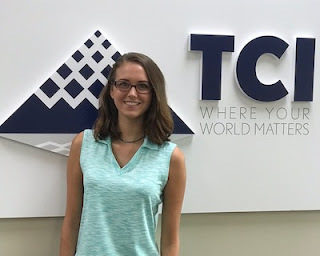 From working on new projects, to attending conventions and trade shows, she is very excited to take on every opportunity that TCI has to offer. Amelia is proud of many accomplishments, yet she claims that she is most proud of her last semester of college, when she had several recognitions for academic excellence. She was chosen as the 2018 Georgia Southwestern Outstanding Scholar which lead her to attend a Board of Regents meeting in Atlanta. There, she was recognized by both the House and the Senate for her scholarly dedication. When Amelia is not working hard at TCI, she loves spending her free time with friends, watching movies, and eating Mexican food. She also enjoys painting as a hobby and is always looking forward to her next travel adventure.